Everyone loves the beach. When you’re planning a vacation or just want to get away from it all, there’s nowhere as warm and welcoming as the beach. It’s a super spot for sunbathing, swimming, surfing, and more; a place to forget one’s worries and flee from the hectic side of modern life to embrace the beauty of nature. Beaches can be found all around the world. Some of them are rocky with big waves and windy conditions. Others are postcard-style locations with the sun beaming down on sparkling white sands and happy sunbathers. Every beach has its advantages and everyone has their own favorite beach. The words ‘beach’ and ‘Barbados’ go hand-in-hand. Whenever anyone hears about this particular Caribbean island, they immediately think of picture perfect beaches with long lines of palm trees, sugary white sands, and warm shimmering waters. Over the years, Barbados has developed a reputation for being home to some of the finest beaches on the planet, and it’s a reputation well-earned. With caves, bays, tropical vegetation, the cleanest sands and the warmest waters, Barbados is the ideal vacation destination. It’s the perfect place to visit if you just want to kick back and let the sun, sand, and sea wash your worries away. Like many Caribbean islands, Barbados has some truly incredible beaches, with many of them ranked among the best in the world. These are the sorts of beaches you see on postcards, with only the whitest sands and pretty palm trees dotted around. There are also lots of little caves and coves to explore, and rich jungles lining the beaches for adventurous travelers to check out too. In short, there are a lot of great options for Barbados beach-goers. Read on to learn all about the best beaches on the island. Down on the southern coast of the island, Miami Beach is also known under the name Enterprise Beach and is one of the most popular spots with the locals. The locals of any location tend to know their home better than anyone else, so it often pays off to visit the same beaches they go to. It's easy to see why Miami Beach is so popular too; it's a lovely spot for all kinds of activities and has a really lively atmosphere, with lots of food sellers offering seafood delights and refreshing drinks to cool off on sunny days. Each week, a Fish Fry event is held on Fridays and offers a great way to experience some authentic local culture. Over on the west coast of Barbados, Brownes is one of the best beaches for anyone staying around the Bridgetown area. It's one of the biggest beaches on the island, with a huge amount of space to ensure that it never feels too busy or overly crowded, and the waters and sands here will make you feel like you stepped into a little piece of paradise. The sands are silky smooth like sugar and the warm waters are a stunning shade of turquoise. This is a great spot for sunbathing and swimming, but it's especially good for scuba diving, with a lot of marine life in the area due to the presence of several shipwrecks off the shore. 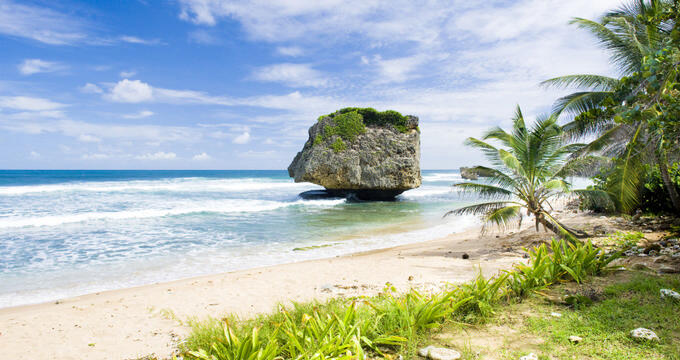 One of the most famous beaches on the island of Barbados, Bathsheba is located right by a little fishing town over on the east coast. The beach stretches out to cover a large space, offering more than enough room to cater for big crowds on busy days. Swimming isn't encouraged at this location due to the rough waves, but surfing is popular here and it's a super spot to sunbathe. Exploration is also fun on this beach, with lots of unique rock formations dotted around and tide pools to investigate. These pools almost function like little natural Jacuzzis too, offering really warm waters to soak in. Out by St Philip on the southeastern coast of the island, Crane Beach is one of the better-known Barbados beaches and is definitely worth a visit. Crane Hotel guests have easy access to this beach, but it's open to the rest of the public too and has lots of useful amenities like beach equipment rentals. Rich vegetation and tall palm trees line the edge of the beach, providing nice shady spots to cool off on sunny days, and the sand is so comfortable to lie on. The waves are quite small here too, so Crane Beach is a nice spot to do some swimming. Located on the eastern part of the island where swimming is usually discouraged, Bath Beach is actually one of the best spots for swimming in all of Barbados due to the unique geological formations in the area that help to keep the currents low and the waves gentle. There's even a pretty little waterfall at this Barbados beach, which is always popular with tourists taking vacation snaps to send to their friends. Gibbes Beach is up near the northern edge of the island on Barbados' west coast. Unlike some of the other Barbados beaches mentioned on this list, Gibbes Beach is largely untouched by the tourism industry. You won't find any luxury resorts or towering hotels in this area. Instead, you'll be treated to one of the most pristine parts of Barbados' coastline. With pretty palm trees lining the edge of the sand and some gorgeous residences to admire along the way, a walk along Gibbes Beach is a great way to spend a day in Barbados.